Do you know how you sometimes overlook an amazing opportunity to eat, just because you pass by a restaurant and it looks more like a takeaway? 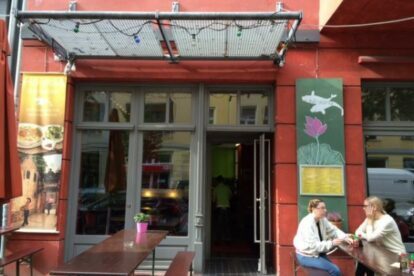 Don’t let yourself be fooled if you cross Ho Vang in hipster heaven Mitte/Prenzlauer Berg, because this one is a real tongue enchanter. Honestly, I was expecting nothing and got everything: an amazing peanut butter curry with baked duck and fresh vegetables for just € 6.50. The ambiente is nice as well, as you can sit on the street when the weather is nice and watch city life pass by your table. From business men to tattooed waiters, eveyone is coming here to enjoy the taste of Asia while heaving their lunch break. There is a plethora of fresh food you can order, alongside a healthy variety for the veggie friends as well. There are so many Asian restaurants in Berlin, but honestly, this one deserves a spot in my personal Top Five. If you are still not convinced, just google the name and look for all the positive feedback – Ho Vang is getting (and deserving) a lot of love.